Anna, Olaf, and Snow Queen Elsa help you keep from spilling your drink! This Disney Frozen Group Blue Glitter 16 oz. 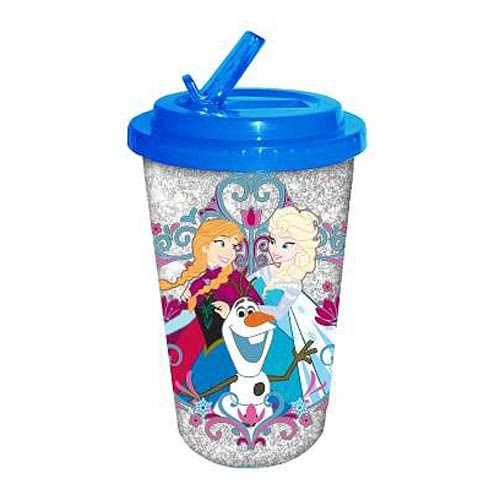 Flip Straw Travel Cup features a nice image of Anna, Olaf, and Snow Queen Elsa on a white glitter background. This great travel cup holds up to 16 ounces of liquid and features a sturdy blue lid with convenient flip straw to help avoid spills. Hand wash only. Not dishwasher safe. Do not microwave. Intended for Cold Beverages. Not for Hot Beverages. For ages 14 years of age and older.